Craighelen boasts many facilities within its grounds. Outside we have 5 all-weather tennis courts, three of which are floodlit to social standards, and two to match standards. Courts 4 & 5 are multi purpose and can be hired at excellent rates for 5-a-side football, hockey etc. Inside we have two heated squash courts which can be used for squash, racketball, mini tennis, indoor games and each has a viewing gallery above. There is also a purpose built fully equipped gym with resistance, cardiovascular and free weights equipment. The CV equipment is fitted with personal TVs. Upstairs, above the gym, is a new, bright and welcoming studio. These facilities are run by Chris Bowman Fitness. On the ground floor we have ladies and gents changing rooms both fitted with generous changing areas and shower facilities. We also have a disabled toilet. 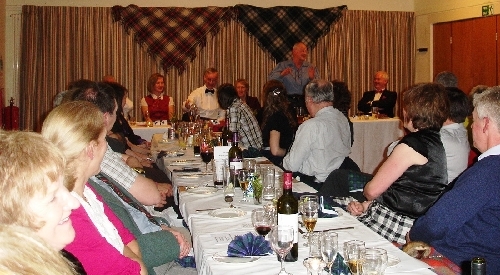 We have a large reception area which is suitable for functions and can be made available to members. We have a fully licensed bar available for members' use, and a fully fitted kitchen equipped with range cooker, fridge freezer, dishwasher, china and cutlery, and serving area. The bar and lounge are offered free of charge for private hire for members - please email the club to enquire about availability - see contact. We just ask a £50 deposit against accidental damage, and would underline that the member hiring the room is responsible for returning it to a good state immediately after use.